In Ree's own words: “I was all grown up when I moved out to the country. When I first arrived, I felt so out of place! But eventually, I looked around and discovered all the wonderful things about country life. So I decided to write a story about my experiences, as seen through the eyes of a little girl named Ree. She has to get up at the crack of dawn, learn to herd cows, and make sure her horse, Pepper, doesn’t eat everything in sight. And that’s all before breakfast! Will she ever get used to this new place? Luckily, the end of the day brings a big family barbecue...and the happy discovery that being a country girl isn’t about the right pair of boots, it’s all about the right attitude. 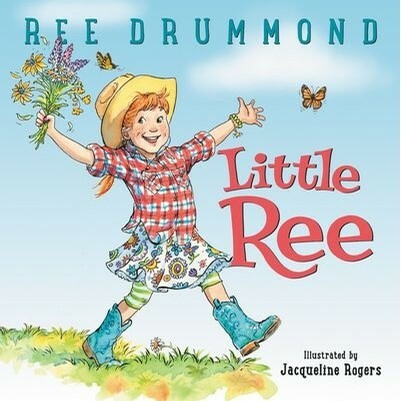 With warmth, humor, and stories inspired by life on the ranch, Ree Drummond’s picture book introduces us to a spunky new picture book star and treats us to a special pancake recipe at the end!